Asia's only river-themed wildlife park, River Safari, has unveiled its first animal icon: Canola the manatee. Abandoned as a calf by its mother, Canola was given a fighting chance to live by River Safari's team of aquarists who bottle-fed the female every two to three hours during the first three months of its life. At the unveiling yesterday, River Safari's deputy head aquarist Keith So, who had named the 22-month- old manatee, said: "Canola is the first manatee hand-raised by aquarists in River Safari. "Its life story shows a relentless fighting spirit, and love and care between wildlife and humans." In place of its mother's milk, Canola was given a special formula infused with canola oil, which inspired its name. "Before I left Canola with its herd, it swam back to me and gave me a hug," said Mr So, citing it as an unforgettable moment. As River Safari's animal icon, Canola is also the wildlife ambassador for all threatened wildlife in the wild, inspiring guests to protect the world's remaining freshwater habitats. "Despite having a rough start to its life, it has developed a very gentle, kind and patient nature," said Mr So, recalling how Canola never jostled for food like other manatees during feeding sessions. He said: "It was a unanimous decision to select it as our animal icon." For the past century, wild manatees have been extinct in Guadeloupe in the Caribbean. 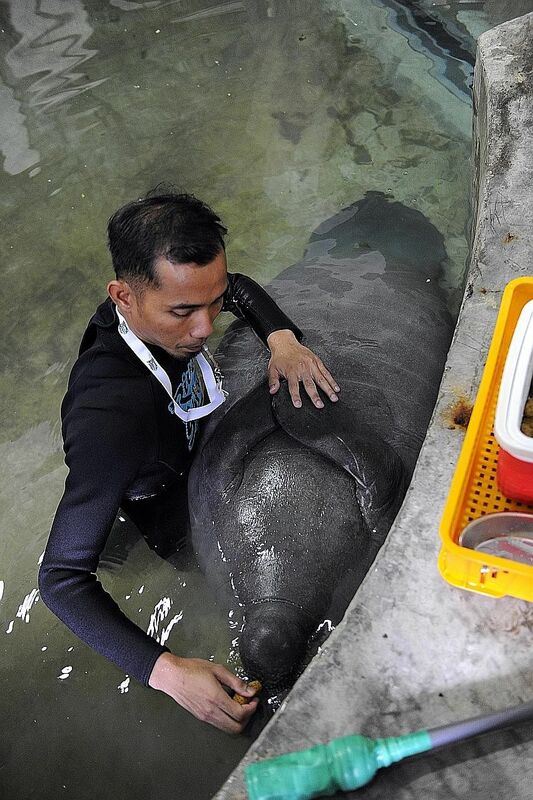 River Safari plans to repatriate two manatees to repopulate the region. • A behind-the-scenes tour with Canola will be held on June 11, 19 and 25. Aquarists will demonstrate how they hand-raise baby manatees and work with Canola on conditioning exercises, in which it is trained to roll over for medical procedures. The maximum capacity of each tour is 20 people. Admission costs $18 a person.